A file that has the RAR or ZIP extension is an archive that contains several compressed files. It is widely used among computer users for it can collect multiple files including photos, videos, images, movies, etc. and turn them into one file, very convenient to deliver and take along. If an archive is deleted, or get deleted, all files in it will get lost. That’s no worse than losing your wallet. Then, is it true the archive lost forever? Is there any way to recover archive and restore file? Just take it easy! It is not a nightmare any longer for you can recover the lost RAR and ZIP files with archive recovery program. UFUSoft Archive Recovery can explore your hard drive with file signature search algorithm and find out deleted or formatted files instantly, even if you have already emptied the recycle bin. When you use Mac machine, turn to Archive Recovery for Mac for help. Install UFUSoft Data Recovery on your computer and launch it. You will see an interface of the program as the image below shows. You can see the instructions of 4 recovery modes this program offers on the start interface. To recover deleted or formatted archive, please select “Lost File Recovery”. After selecting the recovery mode, the program will list all disks on your computer and the storage devices that are connected with your computer. 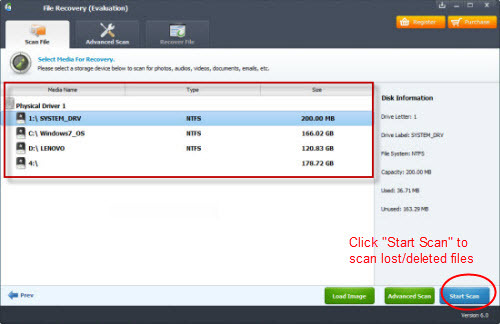 You just need to choose the disk or storage device you want to recover ZIP/RAR files from and click “Start Scan”. When the scan finishes, found files will be listed in types or listed from the original path. You can preview them so as to check those archive files you want to recover. When you have chosen archive files you want to recover, you can save them to your computer or storage device by clicking “Recover”. Note: Please do not save the recovered ZIP or RAR files to the original place, otherwise the recovery might fail. How to Recover Deleted ZIP/RAR Files with Archive Recovery?